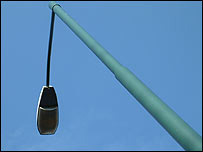 Smart lampposts that could provide high-speed internet access are set to go on trial in Scotland. The idea will be piloted later this month in Dundee but could spread further afield. Backers of the project plan to install six of the solar-powered, internet-capable lights on a rooftop at the University of Abertay. Later in the year they plan to install up to 4,000 more in a student village to be built for the university. The idea will combine lampposts with solar energy and wi-fi wireless internet access. The lamppost will use light-emitting diode (LED) technology to provide bright light using low power derived from solar cells, which use daylight to recharge even in overcast weather. As the Dundee scheme will be on university property the council is not involved. However, the company running the scheme, Compliance Technology (CTL), said interest had already been shown by three other councils in Scotland; Orkney, Perth and Kinross, and Dumfries and Galloway. The firm, whose Scottish arm is based in Kirkcaldy, has European distribution rights for the Singapore-based "StarSight" technology. The firm argued the idea will have massive potential for local authorities, which could could turn their lighting systems into revenue earners. Calum McRae, of CTL, said: "With only a fraction of the installation and running costs of conventional street lights, councils could use smart lampposts to provide street light while selling internet access to local residents, or even providing it free in areas of need. "The new photovoltaic technology which will be showcased in Dundee will mean that no local community needs to be without reliable, economic street lighting, with the added benefit of wi-fi technology outside their front doors." Mary Cowie, director of the University of Abertay Centre for the Environment (ACE), said: "The pilot scheme will involve not only ACE but students from the University of Abertay who will be able to play a hands-on role in shaping the technology of tomorrow." The centre will be involved in testing the technology and assessing its social, environmental and economic impact. Green MSP Robin Harper said: "This is a truly exciting and innovative project with huge possibilities in sustainability terms, and in reducing environmental impact."